Here we have a bumper crop of Francis the Talking Mule, the first three weeks of the strip straight from syndicate proofs, courtesy of that famed purveyor of goodies, Cole Johnson. The phenomenon of Francis began in a series of novels by David Stern. The books were first published in 1946, and a series of seven films began in 1950. The plot device seems almost as tasteless as the later Hogan's Heroes -- the first movie is set during World War II in Burma, and has Donald O'Connor escaping from the Japanese in the jungle aided by a bad-tempered talking mule. Making light of fighting the Japanese in the jungles of Burma may seem a bit bizarre now, but apparently returning vets were delighted to look on the lighter side of that bloody conflict. The Francis movies were wildly popular and so the concept was translated into a daily comic strip that began on May 5 1952. The strip was distributed by United Feature Syndicate and drawn by Cliff Rogerson. Although David Stern got the official writing credit, Alberto Becattini tells me that the strip was actually written by Frank Thomas. As popular as Francis was on the big screen (and later on TV as his doppelganger, Mr. Ed), newspaper editors seemed less than enthused about having him on their comics page. Reading these first three weeks of the strip I'm at a loss to explain why -- the strip looks great, the gags are alright and the storyline looks to have a lot of comedic potential. Perhaps Francis just got lost in the glut of TV and movie tie-in features that were popping up all over at this time. Or maybe Cole found the fatal flaw when he pointed out to me that everybody in this strip is either spitting or sweating profusely. I hadn't noticed it at first, but now it puts kind of a yucky spin on the whole production. Francis got his discharge papers from the funnies page on November 28 1953, a year and a half after his debut. The movie franchise, on the other hand, lasted until 1956. Here's the partially animated movie trailer of the first film and a short scene from the first Francis movie. great stuff. I have some of these lying around, but this is a great quality run. Rogerson also did a panel titled TeeVee Laffs that was put out by McClure Newspaper. I have seen it from 1961 to 1966. TV Laffs ran 1957-1985, but I suspect 1980-85 might have been reprints or a possibly unsuccessful marketing effort. I found some of those tf laffs, but they don't hold a candle to Channel Chuckles by Bill Keane. If you’re not the man to answer this, I don’t know who is. I recently posted a question about the history of comic strips in connection with a post on my crime fiction blog about Max Allan Collins’ novel Strip for Murder. Here’s the question, if you’d care to take a look, and I look forward to some pleasant reading on your blog. (I caught the tail end of “Bringing Up Father” and “Our Boarding House” in my early youth. His question is "When did comics turn to crap? "...Inelegant and presumptuous too. Even if all you know from the history of comics is from this blog alone, you'd see that there's been "crap" amongst the strips from the outset. Maybe Mr. Rozovsky believes there's nothing but Crap anymore, and there is a finite start date to this era. Instead of making a guess, I'd like to remind him that Crap is in the eye of the beholder. You will recall not long ago that Alan stated that he believed "Little Iodine" to be among the worst ever, yet that one never bothered me. There are strips I can't stand, but have lasted decades and still have great popularity, so it's a matter of personal taste. Thank you, Grizedo, for so elegantly and economically stating your thoughts, which mesh perfectly with mine. I too feel that the question is ridiculous. 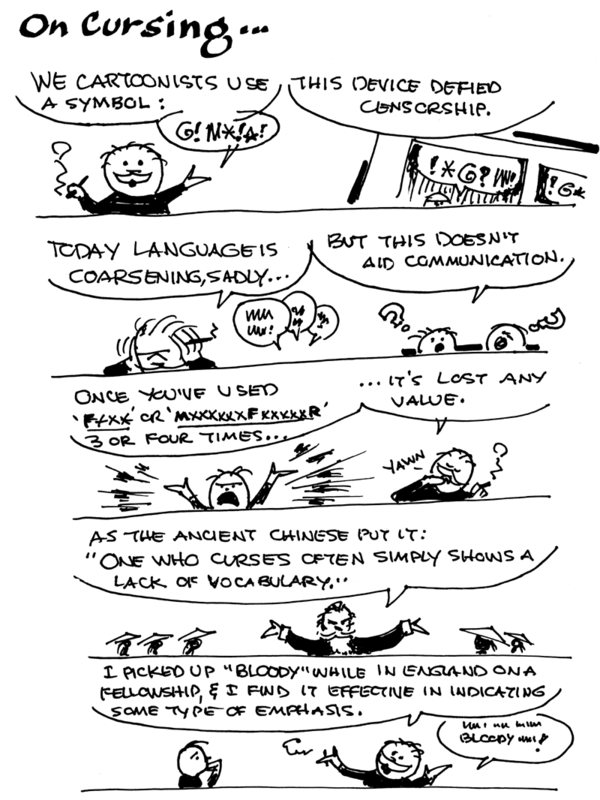 There has been a mixture of crap and great stuff from the dawning of the newspaper strip era until now. To lump such great current offerings like Zippy the Pinhead, Doonesbury, Cul de Sac, Retail (just a few of my current faves) in as 'crap' shows an ignorance of the subject which led me to not even bother answering. Did you know that animator Chuck Jones had a short-lived (less than a year) comic strip in the late 70s? Crawford is a strip about two young boys who contemplate the world of being kids. I am seeking a publisher that would share my vision of collecting the entire run of the strip in a hardcover format, like many of the reprint anthologies that have come out recently. I hope to include supplemental material such as sketches, unused strips and promotional material, should any of this turn up in my research. In order to gain the publisher's interest, I am attempting to gauge the interest of the general public. Would you be interested in a complete collection of Chuck Jones' Crawford? Please leave a comment below! Also, if any of you comic strip researchers have any material that I can use in my book, please send me an email at kurtis@coveringthemouse.com. Allan back again. Please be sure to leave a comment if this sounds like a book you would be likely to buy. Needless to say, I think it a very worthwhile project. Chuck Jones is universally acknowledged as a master of animation, but few have been lucky enough to see his short-lived newspaper comic strip. This strip is so rare that most dedicated fans of Jones speak of it as a myth if they've even heard of it at all. I'm enthused at the possibility of a book that reprints the 6-month run of this legendary feature, and I know many comic strip fans would jump at the chance to see it for themselves. I can only imagine the even greater excitement among animation fans, for whom every tidbit of Chuck Jones' work is precious -- for them Crawford and Morgan must seem like a parchment from the Dead Sea scrolls. I applaud and support all such efforts, although it would not have been my first pick. I just now posted about this on my blog so that even more people can click over here and know about this. That said, if it was a standalone volume focused only on this strip, I'd agree with my friend Ger: it would not be too interesting to me. If it was a book about Jones' non-animation work -- maybe other failed attempts at syndication, etc. -- well, THEN it would be a trove of new and fascinating material. Thanks for your comments, and a big thank you to Allan for letting me post his question here! The book will be a standalone volume focusing on Crawford, but I hope to include plenty of Jones artwork and other material relating to the strip. There will be plenty of supplemental material (hopefully, as long as it comes up in my research). 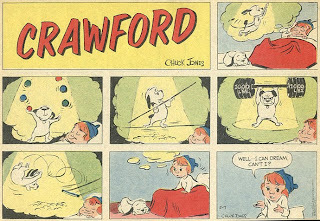 Crawford has an interesting origin story that is even less known than the strip itself! But I'm not saying it here! You'll have to wait for the book! A comic strip created by the great Chuck Jones lasted only six months, I'd suspect it was a train wreck and Chuck would rather let this wither away unseen. I'd rather see his great work than his work that was less than worthy of six months in a newspaper. I'd love to see it. Please keep us posted. I might be interested. Kind of depends how deep my pockets are when the book comes out. I was not aware of this strip. I'm behind all endeavors to preserve, though currently there are so many books out on cartoonists that are more masters of the medium (Milt Gross, Basil Wolverton). Chuck was a master director of animation, but that's a wholly differect medium...I'm not so sure he was cut out for stripping. I also think he had gone past his creative peak by 15 years before Crawford. Although I have no interest in the subject, this book would probably attract animation students/aficionadoes, and Chuck Jones fans and completists of his work. Yes, I would buy the book. The length of time a strip lasts in the newspaper has nothing to do with quality. I suspect animation offered more to Mr. Jones than a newspaper comic strip. Both Fantagraphics Books ("Betsy and Me", "Peanuts") and IDW ("King Aroo", "Rip Kirby") are releasing many new books on old and sometimes forgotten strips. Failing to get their interest, Maybe you should try Lulu and self-publish. I'm kind of interested in it. Who knows, it might shed some interesting light into Jones's life at the time of the strip. If the sample above is as good as it gets, I'd say let that sleeping dog lie. Art: A+. Story: C-. I don't know squat but maybe Apple would dig this. You'd think that Apple has a lot of Chuck Jones fans working there. It would make a nice iBook and they could promote it easily. Getting the rights and material is another story but they might have an in there already as well. Just an idea. An eBook would make this project easier. 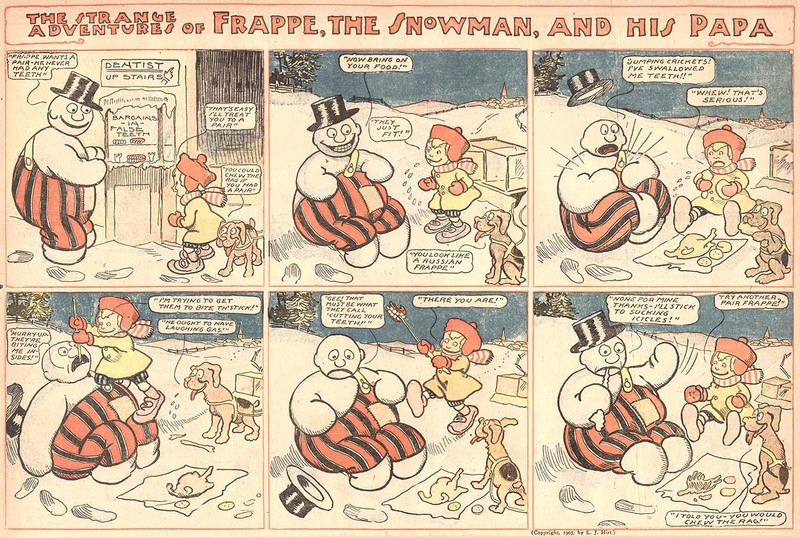 I like the title of this obscurity, Frappe the Snowman and his Papa. At first when I read some strips I wondered, "okay, so where's the papa?" -- and of course as the more nimble-minded of you figured out right away, the little boy is Frappe's papa since he created him. This delightful little gem of a strip ran in the C.J. Hirt-copyrighted version of the McClure Sunday section from December 4 1904 to April 9 1905. It is not unusual for McClure strips to be unsigned in this era, and this strip was never signed once by the cartoonist. I'm thinking maybe A.D. Reed? 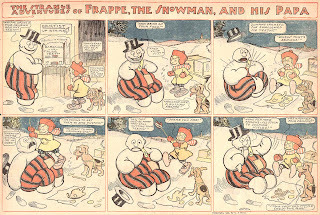 I wondered if the concept of a snowman coming to life, Frosty-style, was already a common bit of imagery in 1904. Most likely a much earlier invention but I found nothing specific in a quick skate around the web. I did, however, find out that Frosty himself dates back only to 1950, introduced in a song recorded by Gene Autry. Also the earliest known image of a snowman goes all the way back to 1380 in a Book of Hours. And believe it or not, there's an entire book devoted to the history of snowmen, titled, appropriately enough, History of the Snowman. I remember seeing one of those regional treat shows on The Food Network a couple of years ago and remember seeing a place where milkshakes are traditionally called "frappes". A quick internet search tells me, in New England and some British Commonwealths, milkshakes aren't made with ice cream, but when they are they call them frappes. A fitting name for a snowman. The Comics Reporter says today (April 19, 2010) is Mr. Ivey's 85th birthday. And thanks for your weekly strips.